Go from the Predictable to the Achievable! Big Dashan's systematic approach to the development of you, your team and your business will lead to astounding improvements in productivity and organizational effectiveness. If you want it, you can achieve it! To learn more, email us or call 613-841-1229. Our monthly newsletter inspires readers to even greater success. Dashan in Chinese means big mountain. A mountain can be viewed as an obstacle or a gateway to your goals. 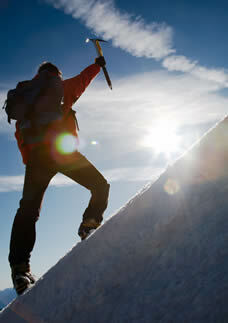 At Big Dashan, we can help you find the path to the summit! Need to bridge a performance gap? Build upon your leadership skills? Find out how executive coaching can help you.